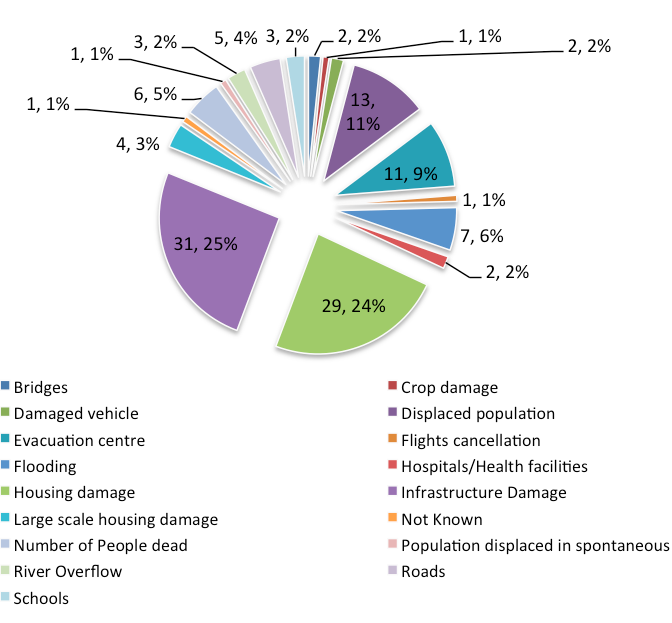 Our mission as digital humanitarians was to deliver a detailed dataset of pictures and videos (posted on Twitter) which depict damage and flooding following the Typhoon. An overview of this digital response is available here. The task of our United Nations colleagues at the Office of the Coordination of Humanitarian Affairs (OCHA), was to rapidly consolidate and analyze our data to compile a customized Situation Report for OCHA’s team in the Philippines. 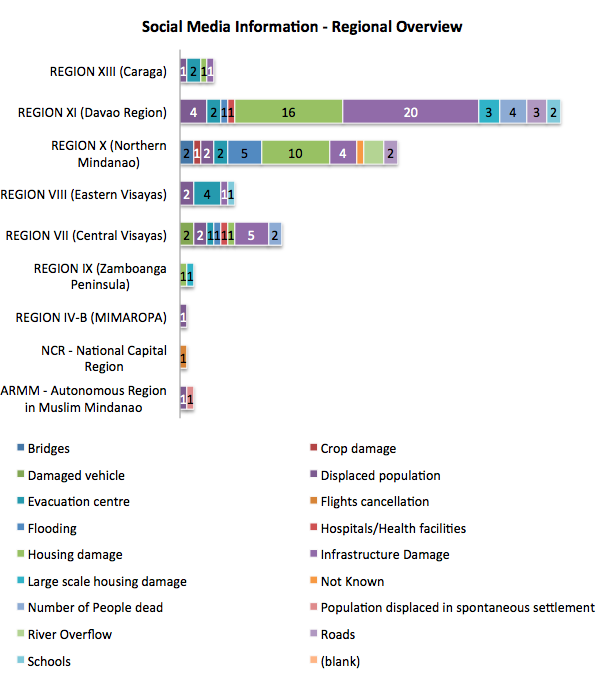 The maps, charts and figures below are taken from this official report (click to enlarge). This map is the first ever official UN crisis map entirely based on data collected from social media. 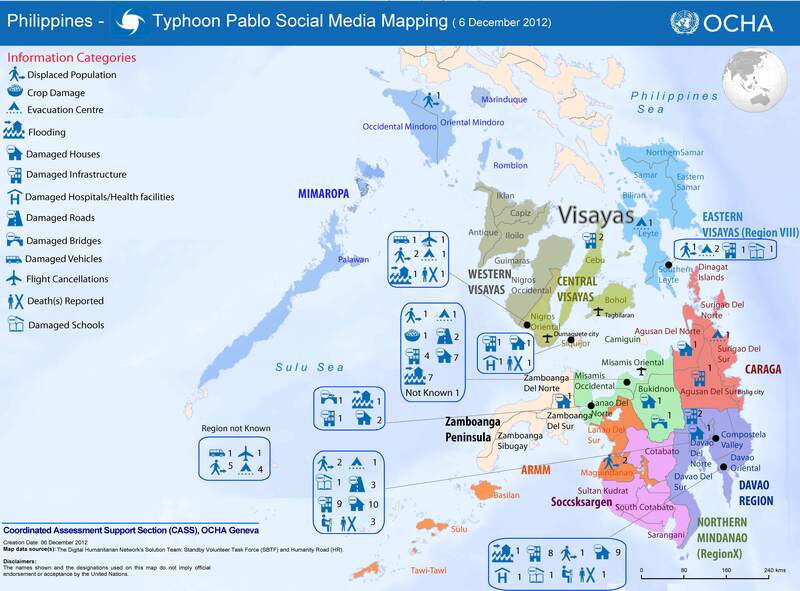 Note the “Map data sources” at the bottom left of the map: “The Digital Humanitarian Network’s Solution Team: Standby Volunteer Task Force (SBTF) and Humanity Road (HR).” In addition to several UN agencies, the government of the Philippines has also made use of this information. 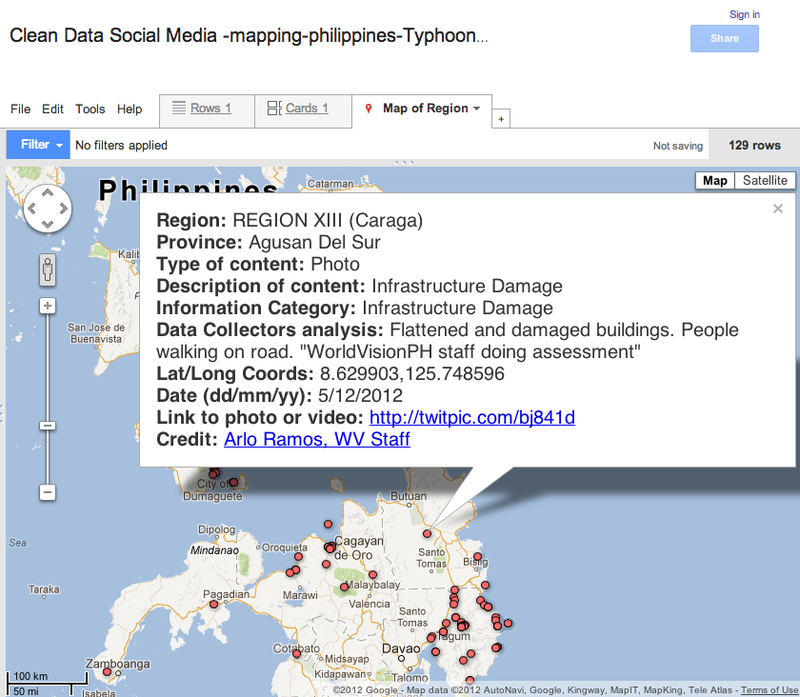 The cleaned data was subsequently added to this Google Map and also made public on the official Google Crisis Map of the Philippines. One of my main priorities now is to make sure we do a far better job at leveraging advanced computing and microtasking platforms so that we are better prepared the next time we’re asked to repeat this kind of deployment. On the advanced computing side, it should be perfectly feasible to develop an automated way to crawl twitter and identify links to images and videos. My colleagues at QCRI are already looking into this. As for microtasking, I am collaborating with PyBossa and Crowdflower to ensure that we have highly customizable platforms on stand-by so we can immediately upload the results of QCRI’s algorithms. In sum, we have got to move beyond simple crowdsourcing and adopt more agile micro-tasking and social computing platforms as both are far more scalable. In the meantime, a big big thanks once again to all our digital volunteers who made this entire effort possible and highly insightful.